One of our long time contributors (check out his ice climbing gear primer) here at Cascadeclimbers.com has put together a really cool tool for watching local snow conditions in the Pacific Northwest. 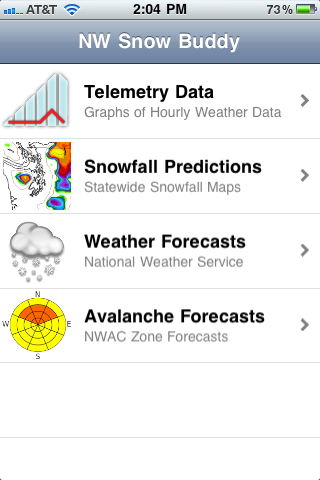 Dave Burdick, AKA AlpineDave, has created an iPhone/iPad app called NW Snow Buddy. NW Snow Buddy is available now in the Apple iTunes Store, so click here to get it for $2.99. From Dave’s webpage for the application (click to visit), it looks like he has plans for a version that works with the Android phones too. Snag a copy and support Dave’s work! Having the latest local snow and avalanche conditions in your hip pocket in a easy to read and instantly accessible format could be a life saver! The Seattle Bouldering Project - Progress Update!